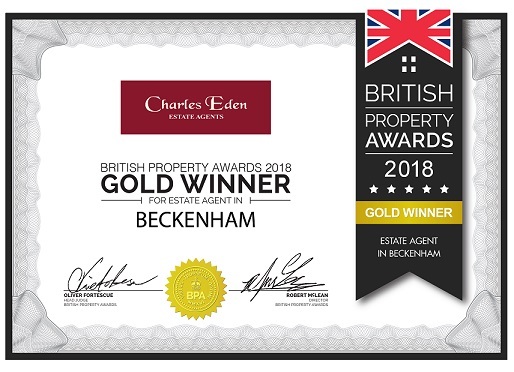 We are unique as an Estate Agent in Beckenham that all of our team have undergone training which has been “Approved by Trading Standards” through the Guild of Property Professionals. The Guild Associate Training Scheme is a comprehensive programme covering all aspects of Estate Agency practice & legislation. “Regular training is essential to keep up to date with the latest legislation as well constantly refreshing our knowledge. 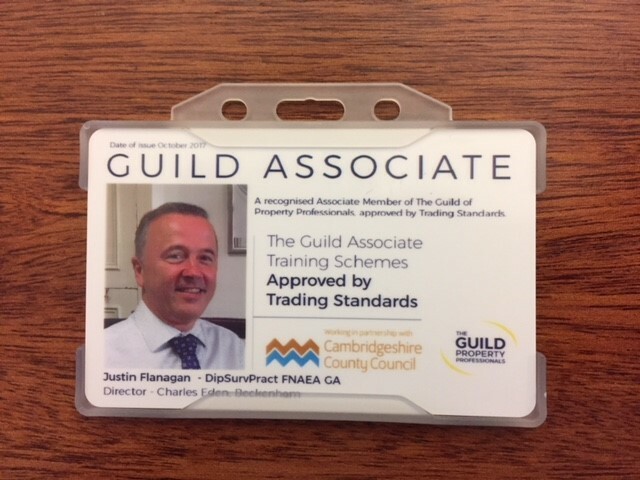 The fact that the Guilds scheme has been recognised by Trading Standards is very rewarding and hopefully gives confidence to the public that they are dealing with Property Professionals when they deal with Charles Eden” said Director Justin Flanagan. It was great to see one of our flats feature in the last episode of Channel 4’s Location Location Location and very amusing seeing Kirstie testing out the corner bath. 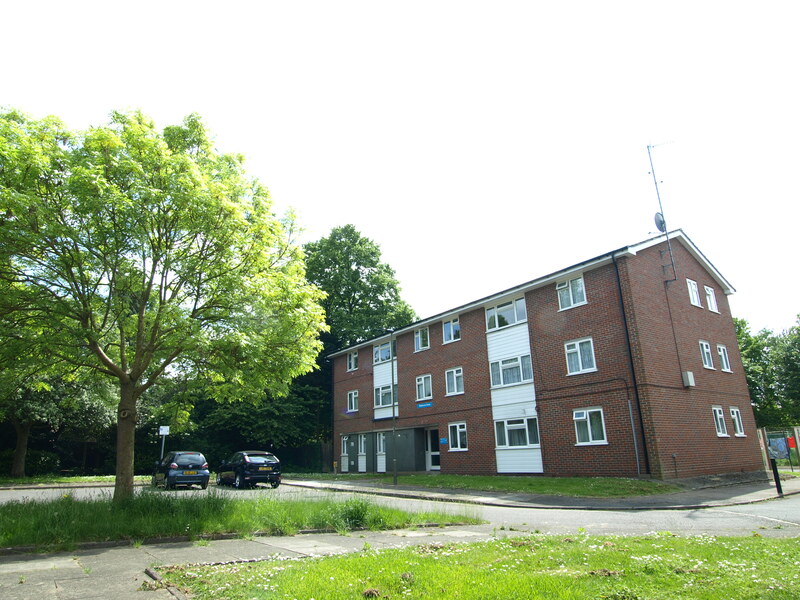 The property is currently for sale and can seen on our website at the link below. Always looking to improve our offering we now have our new website up and running. The website is responsive meaning that it adapts itself to the type of device on which it is being opened making it a much better user experience being more readable on smaller screens such as phones. We have also incorporated an instant online valuation tool which gives a rough idea of price based on limited information based on other sales data available. This of course is just an approximation and certainly should not replace the Free Market Appraisal which we provide by actually visiting a home and discussing in person based on a more detailed inspection. 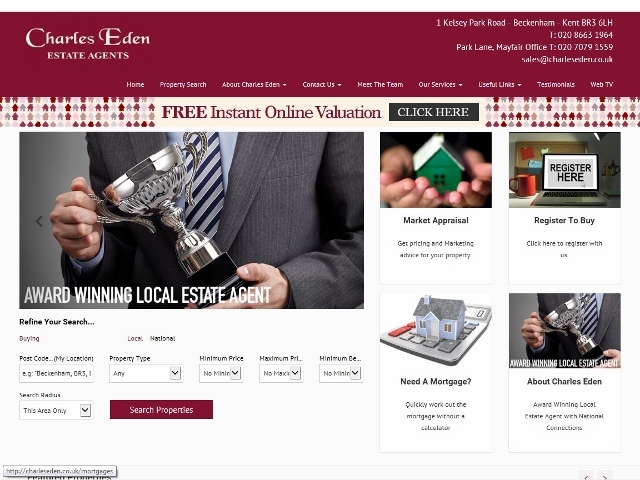 If you are looking to sell a property just give us a call as we’d be delighted to display you r property on our website and our Free Appraisal will not only advise you on price but also show you in more depth the service we provide. Once again, The Guild Conference took centre stage at the Millennium Hotel, Grosvenor Square, Mayfair on 29th January. A record number of over 350 agents were inspired by a fantastic range of speakers including Google, Santander, Sticky Marketing, Teads and many more. The conference venue was transformed for a sumptuous Gala Dinner, which included the announcements of the winners of the Guild’s Annual Awards for excellence. The awards are always a very closely fought affair and the standards of entries were “simply phenomenal” this year. 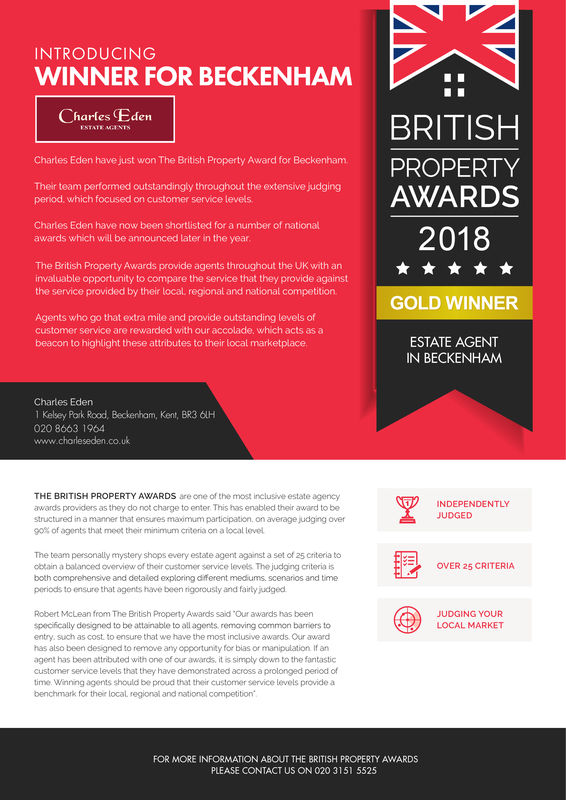 Marcus Whewell, CEO of The Guild of Professional Estate Agents, presented the awards, commenting ‘Rewarding outstanding achievement within our network is an honour and a privilege. The quality of award entries this year is the highest ever, reflecting how our organisation is moving forward and assisting its agents to provide a truly unique and exceptional service to the public. Charles Eden of Beckenham were delighted to be acknowledged again in the presentation receiving the Silver Award for the South East region. Pictured here are Justin Flanagan MD of Charles Eden and Paul Stone the Charles Eden Sales Manager receiving the award from Guild CEO Marcus Whewell. Many of us will be more familiar with MMR when referring to a vaccine but anyone in the mortgage industry knows it only as the Mortgage Market Review. This has been years in the making and will lay down new rules around the sale of mortgages in a bid to prevent a return to the lax lending practices at the peak of the market. As a result the MMR will provide a framework for mortgage lenders and advisers when it takes effect on 26th April. But what will it mean for borrowers? Much of the focus of MMR is on lenders showing that a mortgage will be affordable for the borrower, not only now but also in the future. Although self certification died out years ago the new rules ensure it won’t return and all income must be proven. Affordability models have been used by lenders for some time rather than a straight forward income multiple, but borrowers should expect to be asked more detail around their monthly budgeting and expenditure. Having a good idea of how much the household spends on food, utilities, travel and childcare will be required when applying for a mortgage. Lenders will also apply a stress test to make sure that the mortgage will be affordable as rates change as well as on day one. That will see lenders apply assumptions based on how rates are expected to move over the next 5 years. Although many of these approaches are already part and parcel of the mortgage market there will be tweaks and changes to come. It may even see lenders step off the gas as they look to bed in new systems, so mortgage rates may even edge up slightly as a result. What it does do is underline the need for advice. Tailoring the right mortgage deal to the right borrower is vital. It is now about much more than simply finding the lowest rate, and ensuring that the borrower is likely to meet the lender’s criteria will help save time, money and heartache. Using The Guild’s fee-free mortgage advice service will help borrowers find a solution tailored to their individual needs, as well as reduce hassle by providing assistance with the mortgage process from start to finish.